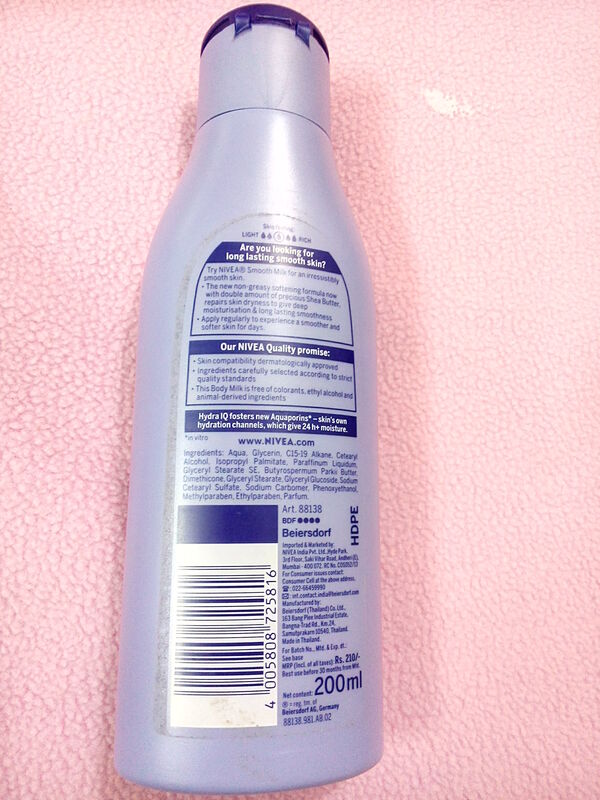 Nivea smooth milk body lotion for dry skin comes in a no-fuss light blue plastic bottle with a flip open cap. Mild floral notes dominate this moisturizer’s typical Nivea scent. A touch greasier than Vaseline cocoa butter, Nivea body lotion is full of moisturizing ingredients like Shea Butter, Gingko biloba and vitamin E.
I also like the fact this body lotion is free from any colorants or animal testing. This shea butter lotion has been my HG moisturizer throughout winters, and my skin and I had been happy with it. But come summers and this ultra-moisturizing lotion started behaving to be heavy on the skin, leaving behind a greasy and sticky residue. So even though it gives you long lasting smoothness and keeps your limbs soft and supple for good 24 hours, it isn’t for hot weather or oily skin. Oily skin beauties, you better steer clear of it. Best part is it has given my chronically dry skin a break! Temporary or permanent but my skin certainly has an improved texture and tone after using this lotion. 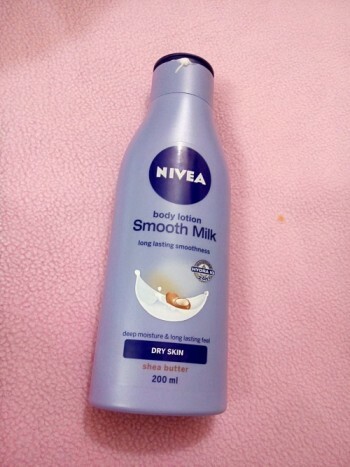 On the whole, Nivea smooth milk body lotion with shea butter is an excellent body lotion for dry skin. It comes out true on most of its claims. Enriched with deeply moisturizing ingredients the body lotion does provide long lasting smoothness. However, the lotion is not for warm weather and oily skinned beauties. Daily moisturizing is a must, especially after a hot shower. I use CeraVe since I have dry itchy skin and it’s dermatologist recommended. But Nivea also has a great reputation. The fragrance might irritate my skin though, sensitive as it is. Thanks for sharing this Anshulika!! This can be an awesome product for my skin! My skin gets too dry in winters!!! WOw! Will definitely check this one out in the winters! Great review. I haven’t tried this body lotion yet but I love the typical Nivea smell and my skin isn’t oily 😀 Happy Thursday Anshulika! It was such a wonderful article dear and from my side I want to say that i am using brightening body lotion from long and its really effective. SheaMoisture’s Raw Shea Butter Body lotion is a complete body care product that quickly absorbs into the skin to provide natural defense against weather elements. Thank you for such an awesome article dear and from my side I want to say that i am using coconut hibiscus lotion for my hair Because this provides nourishing moisturization to make your skin smooth and irresistible to touch! The product is meant for bodily application so not suitable to apply on your facial skin. Please understand, the skin on your face is different and more sensitive than skin on your body. Hi Rose. The product is meant for bodily application and hence not suitable for facial skin. Understand, our facial skin is different and more sensitive than the skin on our body.